Why use a coring system for turning bowls? Imagine taking a premium quality turning blank and not only turning it faster, but also with less effort, less wear on your tools, less waste to clean up - and winding up with several bowls instead of just one! If you are passionate about bowl turning you';ll appreciate the many ways the Easy-Core can very quickly pay dividends for itself. How Does the Easy-Core Work? - A heavy duty steel base plate attaches to the bed of the lathe. Two supports, one for the support finger and one for the cutter blade, are attached to the base plate. The support finger and cutter blade fit into these supports. The position of the support is determined by the size of the blank being cored and the wall thickness desired. A tool handle is attached to the cutter blade and is used to introduce the cutter to the wood. This system has been designed in such a way that the tailstock can be used while coring. 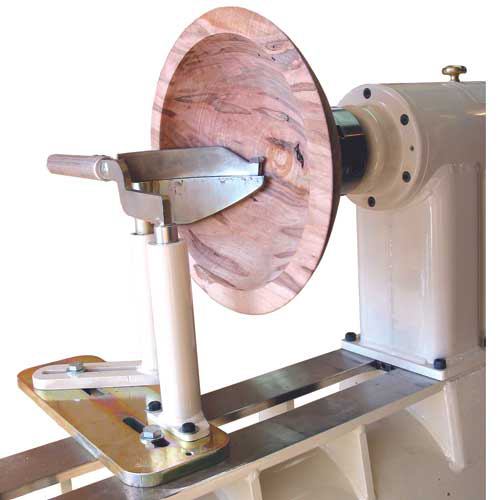 Using the tailstock in any wood turning operation greatly increases the safety factor. When the entry cut is made, the support finger is positioned at the face of the bowl supporting the cutter blade. With the cutter is on a fixed arc and it becomes a simple matter of deepening the cut by exerting pressure with the handle. After progressing 2 - 3 inches into the groove, the cutter is removed and the lathe stopped to re-position the support finger by introducing it into the groove. This procedure is repeated until the knife reaches maximum depth. The core is then removed by tapping the edges or a bit of easy prying. Cores produced will be symmetrical and have a smooth surface. Easy-Core Base Set - The unit needed is determined by the swing of the lathe. The swing is the distance from the middle of the spindle to the bed multiplied by two. Any size lathe from 16" to 26" swing and flat bed ways can be accommodated with the Easy-Core Coring System. Base Set includes: the Base; Front & Rear Post; Short Tool Handle; Screws & Washers; and an Instructional DVD. Note: Knives and Clamp Block Sets sold separately. See below. Clamp Block - Required for attaching the Base Unit to your lathe. To determine the size of the Clamp Block needed, measure the gap between the bed ways. This gap determines the Clamp Block required. Clamp Block sold separately. Knife Sets - The size of the sets determine what size bowl blanks can be cored. There are four knife sets available for the system. (9", 11", 13" & 16"). These Knife Sets are purchased separately. The Knives are made from quality materials to ensure they hold up to the task at hand. The supports fingers for the 9" & 11-1/2" sets are constructed using 60,000 lb tensile carbon steel, whereas the support fingers for 13" & 16" sets are made from 100,000 lb chrome nickel steel. Knife Sets include: a knife; a knife support, and a cutter. Cutter & Sharpening Jig - The Cutter for the knife sets is replaceable and easily sharpened on a bench grinder platform with the Sharpening Jig (#32743). The cutter is made from HSS CPM M4.